This 2.5-inch USB 3.0 drive offers up to a full 5TB of storage. All things being otherwise equal, 5TB of capacity is better than 4TB. 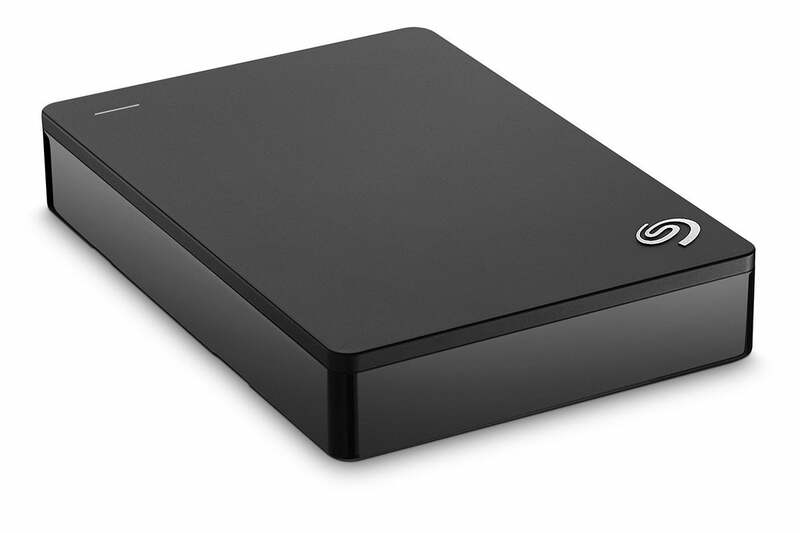 Things aren't entirely equal in this case, but close enough that the $140 Seagate Backup Plus 5TB 2.5-inch USB 3.0 hard drive is a tempting product. I don't want to let it go, and I have more USB drives than I need. Said temptation applies only if you're one of those who falls prey to the "stuff expands to fill available space" syndrome. You may not think of yourself as a part of that clan, but if you get anywhere near a 4K video camera, you might be a card-carrying member before you know it. 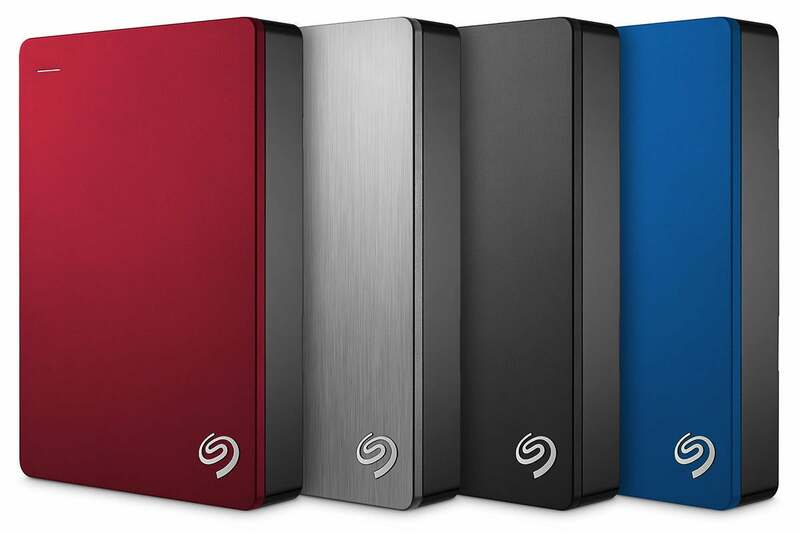 As shown at the head of the article, the Backup Plus 5TB is available in red, black, silver, and blue. The review unit Seagate sent us was basic, innocuous black. Color-coded drives are handy if you're storing separate projects, rotating backups, or just trying to keep track of what's what. The little black drive is always a classic. This is the unit Seagate sent to us. The Backup Plus Portable 5TB measures about 3 x 4.5 x 0.75 inches and weighs about half a pound. That's neither small or light for an external USB hard drive. But hey, if you want 5TB, you're going to have to deal with a couple of extra ounces—it takes another platter or two to hold the extra data. The unit features a micro-USB port and comes with a cable that plugs into standard USB Type A for transfer speeds of up to 5Gbps. 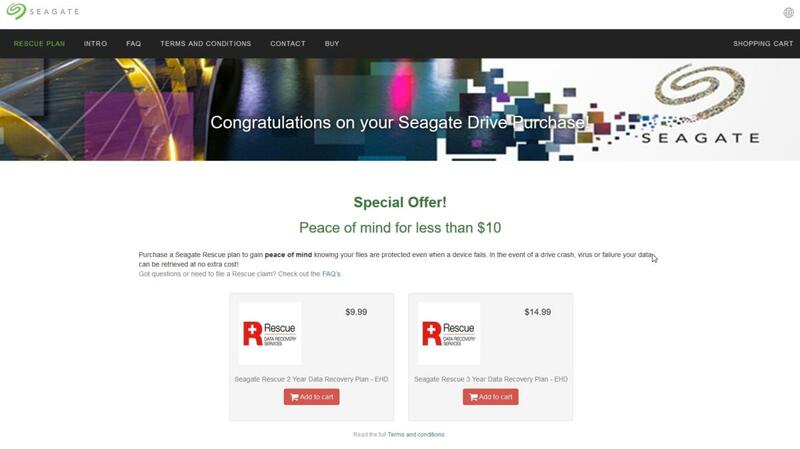 Seagate provides a setup utility, which allows you to register, download the Seatools or Dashboard backup utilities, and offers you a data recovery warranty for $10 for two years, or $15 for three years. You can purchase recovery insurance, but don't rely on it. Recovery is not 100% certain, so keep your drive backed up. What you do about that is your own affair. Data recovery without the warranty can cost many hundreds of dollars. But it's all about the odds--drives don't always go bad. Indeed, most of mine have lasted more than three years. One thing you shouldn't do is rely upon data recovery rather than maintaining multiple backup copies of your data, for the simple reason that it's not always possible to recover the data. As an interested reader and new Backup Plus owner recently reminded me via Answer Line, there is no security software bundled with this drive. If you need to password-protect, look to WD and others. The Backup Plus 5TB was a very good performer writing and reading large files, as well as reading small files. But like its LaCie Porsche Design cousin (Seagate owns LaCie), it fell well off the pace writing small files and folders. So much so, that we double- and triple-checked the formatting, thinking it used FAT. The older but universally compatible FAT file system is slower than NTFS is with small files, but the Backup Plus 5TB was indeed formatted to NTFS. Go figure. Overall, the drive is plenty fast and perfect for its intended role as, yes—a backup drive. Seagate's Backup Plus 5TB is a very good performer with large files, but there's a bit of a drop off when writing smaller files and folders. 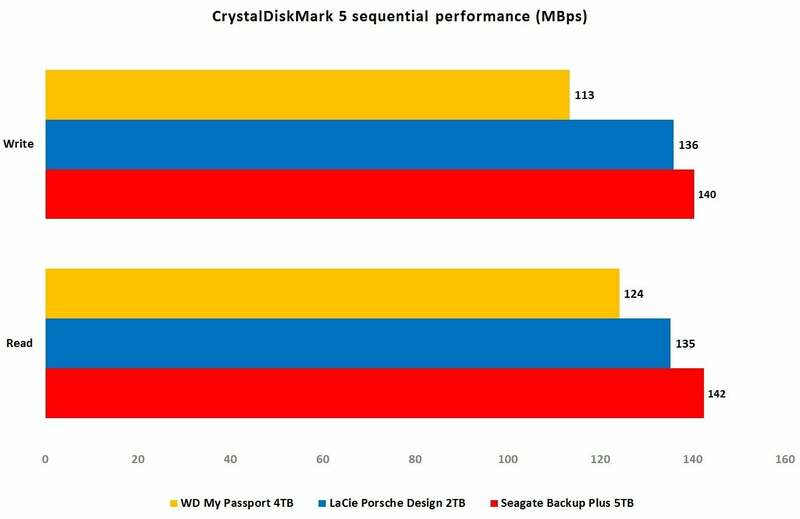 The Seagate Backup Plus aced its encounter with CrystalDiskMark. It didn't fare as well with our 20GB mix of files and folders, as seen below. Seagate owns LaCie, so losing out to the LaCie Porsche Design 2TB was a small blow for the Backup Plus 5TB. It beat the WD My Passport 4TB in sustained throughput. How can you not like a drive the fits in your pocket (at least your larger pockets) and holds 5TB of data? I can't, and I'm betting you can't either, though you could get away a bit cheaper with WD's 4TB My Passport. 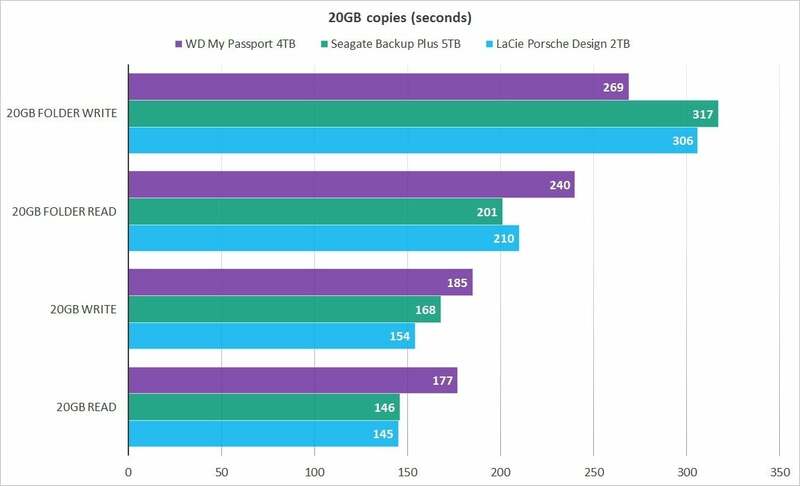 Note also that Seagate's $220 Backup Plus Fast 4TB offers about twice the performance of other external 2.5-inch USB drives by employing two hard drives striped in RAID 0. But 5TB? Come on now. Nice. If capacity and portability are your primary concerns, and the Backup Plus Portable fits up to 5TB in pretty much a standard 2.5-inch USB external package. It's fast with large files, but on the slow side with small ones. Regardless, it's a worthy drive that gives you more space for your movies and games.